Whisk together the flour, baking powder, sugar and yeast in a bowl. Make a small well in the center. Mix together water and oil, then pour slowly into the flour, whisking it in and working in the flour slowly. Place the dough into a lightly oiled boil and cover with cling wrap. Let rise about 45 minutes in a warm place, until the dough is approximately doubled in size. Cut the dough into 8 pieces for medium buns or 12 pieces for small buns. Form each piece into a ball, then roll out into a circle about 1/4" thick, or slightly thinner. Brush each piece of rolled out dough with oil on one side - this will make it easy to open the bun after it's steamed - then fold it in half and place it on a piece of parchment paper. Set aside and let rise for about 20-30 minutes, then steam in a bamboo steamer or shallow pan over boiling water for 7-8 minutes. When cooked, move the buns on their parchment paper to a cooling rack to prevent water from gathering beneath the bun and making it soggy (you can skip this if you're using the bamboo steamer, as the slats in the steamer will naturally prevent this). 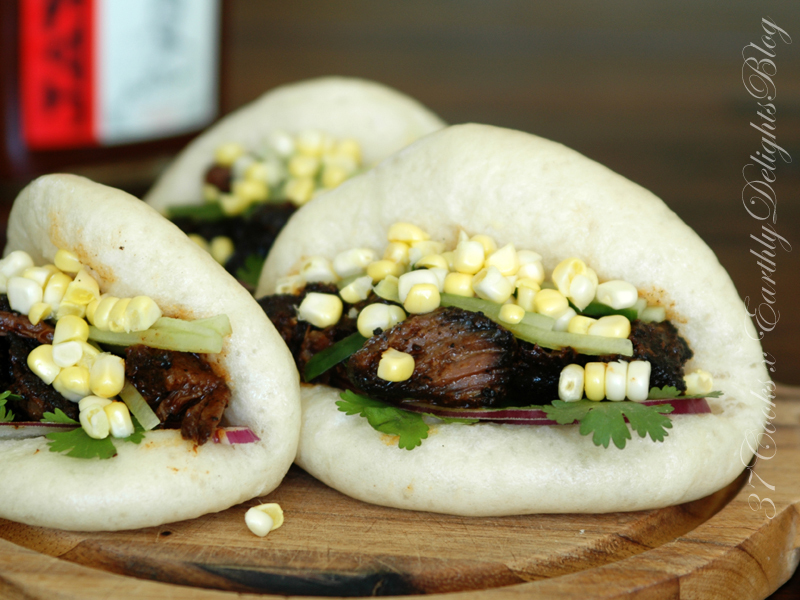 If not using right away, you can freeze the steamed buns and reheat them by steaming them for a few minutes. Mix together the dry ingredients and rub over the ribs (or use a favorite dry rub of your own). Cover and let sit in the refrigerator overnight. Preheat the oven to 350°F, then roast, covered, on the middle rack for 2 hours. Turn on the grill and set to medium heat, then grill the ribs until warmed through and lightly crispy on the edges, flipping and brushing every 4-5 minutes or so with Jay D's Louisiana Barbecue Sauce (total grilling time about 20 minutes). Let cool for about 5 minutes, then tear into small chunks with a fork, removing the bones. Stir in 1/4 cup of Jay D's Louisiana Barbecue Sauce. Place a few slivers of red onion in a bun, then top with a few cilantro leaves. Pile in some of the beef short ribs, the top with julienned cucumber and corn kernels. Serve with more Jay D's Louisiana Barbecue Sauce on the side.